Amy and Tim Wilson describe themselves as “forced poor.” Their annual income of $25,000 makes it a constant challenge to support a family of five, but it keeps them eligible for the Medicaid program that covers most of their son Hunter’s ongoing medical expenses. “I would be cutting my own throat to go back to work,” says Amy. Amy and Tim Wilson moved their family to Little Rock, Arkansas so their son Hunter, 9, could attend the state’s only school for the deaf. 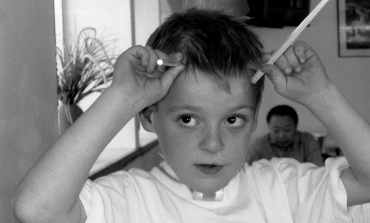 An antibody deficiency, however, has since left Hunter unable to attend school at all. A teacher comes to the Wilson home four hours a week. Amy, an EMT, had to stop working in order to care for Hunter. His frequent hospitalizations and the lack of suitable child care make it impossible for her to maintain employment. “Besides,” she says, “if I did go back to work, Hunter would lose his SSI and Medicaid.” Tim works two jobs to support the family of five, earning $25,000 a year as an insulation blower by day and a FedEx courier by night. Because of lung disease, Hunter uses a ventilator much of the time and a wheelchair when he is having trouble breathing. He also needs an intrapulmonary percussive ventilator (IPV), pulse oximeter, feeding pump, suction pump and globulin infusion pump. The family’s electric bill is $300 per month, in large part due to Hunter’s equipment. Sometimes they skip a car payment to make sure the electric bill is paid. While glad to have Medicaid benefits for Hunter, the family can be frustrated by its one-size-fits-all regulations. “Medicaid provides thirty suction catheters per month,” says Amy. Hunter doesn’t need to be suctioned that often. On the other hand, “he can only get one new hearing aid a year. He is supposed to wear them in both ears, but right now he only has one because he lost one, and it’s not time yet to get another one.” The move to Little Rock meant leaving behind Amy’s mother, a primary part of the family’s support system. When Hunter is hospitalized, Tim drives the family’s other two children 150 miles to stay with their grandparents so he can keep working and Amy can be with Hunter. The gas costs are significant. Hunter is occasionally able to eat normally, but most of the time he is fed through a G-tube. “We’re actually kind of lucky that way,” says Amy. What she means is that, when Hunter is in the hospital, the staff will bring him a meal tray, which he won’t touch. Because her son is technically able to swallow but prefers to receive nutrients by tube, Amy gets to eat. She says “lucky” without a trace of irony.